A hardware controller can help you to get more hands-on with your digital DJing. Digital DJing has always been a contentious topic and, while it's struggled to gain legitimacy in the eyes of more traditional DJs, for better or worse, technology is moving on. 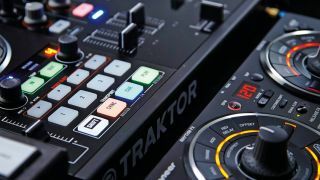 However you choose to approach it, the big names in DJing software - NI's Traktor and Serato - offer a whole new world of creativity. Read on to find out how you can get the most out of it. For more suggestions on how you can get creative with your digital DJing check out Future Music 282, which is on sale now. If you're a fan of using cue points then Traktor's Snap and Quantize modes could well become your new favourite toys. The buttons that activate these modes can be found below the Main volume output knob in the Mixer view. Click the S button to activate Snap mode, and now whenever you add a cue point on the fly it'll snap to the nearest beat. Activate Q, and when you recall a cue point Traktor will automatically quantise it to the nearest beat. So, with both Snap and Quantize mode active you can jam out a new arrangement on the fly without ever missing a beat, and you'll never go out of sync with any other tracks that are playing. Serato Remote works with Scratch Live and Serato DJ. It's cheap, has great playability and offers full control over the SP-6 sampler on a single screen. Both Traktor and Serato DJ make recording promo mixes or live sets a breeze, with integrated recorders. In Traktor, open View>Layouts>Mixer and click the cassette tape icon near the top right of the interface. If you're using Traktor's internal mixing you can simply click the record button and get mixing. If you're using an external mixer, then you'll need to open the Preferences menu and set up an input using the Input Routing page, then assign this input to the recorder in the Mix Recorder page. Serato DJ, meanwhile, will record the output of most controllers via the Rec button on the top left of the interface - be sure to select Mix as the output. Don't play out audio files with too low bitrates. Aim for 320kbps - the higher the number, the better the sound. You can tell over a big rig, or if you're following a DJ playing vinyl. Traktor DJ is Native Instruments' mobile mixing app for iOS devices, and it's actually a very well realised bit of software. It includes a surprising amount of the Mac and Windows version's functionality, and it's even possible to cue up tracks on headphones using Apple's Camera Connection Kit and a Traktor Audio 6 or 10 interface. Compile crates for every occasion. Clicking on a perfectly flowing set of Peak Time Bangers or those one-off Killer Last Tunes when the time is right will cast dancefloor magic. Don't be scared to start your sets with drum-free atmospheric music. Open with sweeping textures rather than a stomper. It resets the mood and lets people forget the last DJ.